This stroller has the best push for a double. Since the weight is put over the wheels, itâ€™s a breeze to push, even with one hand. The flexibility of being able to convert from single to double and back to single again is so nice. Great full-size stroller. 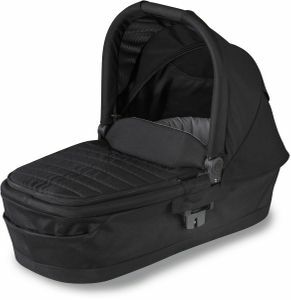 Easy to attach infant carrier, light weight and not too bulky. I love love love this stroller. Itâ€™s so compact and stylish. Got it at the sale price and I could not be happier. Itâ€™s so easy to switch the seat from front to review facing, and talking it off is a breeze. I donâ€™t reallg like the way it fold but itâ€™s not a big issues as it still fits perfectly in the trunk of my small car. I would recommend this stroller to anyone. So happy with this purchase. 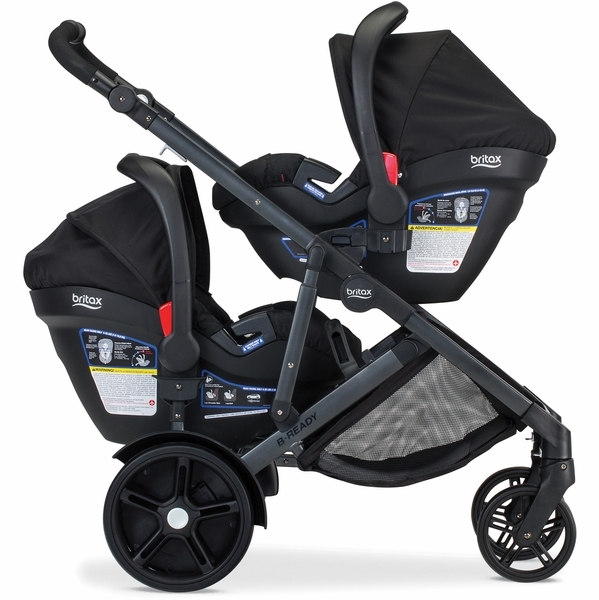 I love this double stroller to go shopping or to go for walks. If you are looking for stroller that can take two small kids (in my case Infant and Toddler), but would like to be able to fit through crowded areas, then this stoller is for you. It is a cheaper alternative to the new strollers that are out there such as Uppa baby Vista or Nuna. I have to admit the top seat of this stroller worked as a diaper changing station when I attended a venue that did not have a diaper changing station in the bathroom. Being said, the versatility of this stroller (especially the tall top seat which goes completely flat) is amazing. ProsGreat for a trip to the mall, target, grocery store, neighborhood walks, concrete, and all other smooth terrain. ConsNot great for all-terrain surfaces. I noticed tires were acting up after I took my kid to a pumpkin patch in which the stroller had to go through a lot of dirt and rock terrain. We havenâ€™t put this to use yet because itâ€™s just so heavy! Iâ€™m using our single stroller as long as possible because I can hardly lift the b-ready while Iâ€™m pregnant- hopefully that will get easier when the new baby arrives! I love that it folds with both seats but I do wish it would fold with the lower infant car seat attachment- it seems silly that I will need to remove that each time. I like how versatile it is and my daughter really seems to love it. It maneuvers really well even in our small hallways and doors. Wish it was a one handed fold but I know that isnâ€™t really an option on most double strollers. 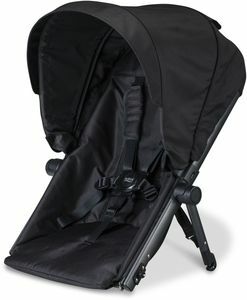 We love Britax products and it is great quality just like our other stroller and seats. Love that our b-safe pops right in. I have confidence that this thing will last and will be a lifesaver with my two little ones. Iâ€™ll just need a nice tote in the car to store all of the attachments we have! We bought this stroller to make it easy for us to travel without having to carry the kids and our luggage at the same time. ProsLooks comfortable Love the red material Love the fact that I can attach my britax car seat with the appropriate adapter. The black color is very nice. Looks very sophisticated. Love everything about it. So far this stroller is a great buy. It wasn't a cheap price point, but neither is the quality. It goes together and comes apart very easily. It's folding and unfolding is fairly intuitive and easy and it's overall just great. Minor things that bother me are that there is no tray for snacks or cupholders. Also having bought in preparation for the second child I would have preferred the option to have the second seat over the seat it comes with. Sooo i loved my other britax so much, i bought a second! Lol this one I loved because you can switch direction of the baby facing you or facing ourward! I gave it away and I'm so sad but happy that another child got to enjoy it as much as we did! Now we have another baby and I miss it so much!! Love the sleek look, i got the all black and definitely the best option!!! Bulky & even bigger when folded. Easy to fold, hard to carry and does not fit anywhere. If your a man do not get stuck hauling this thing, I'm in Disney having a nightmare with this thing. Selling it on 5mile as soon as we get home. I loved it!! Only thing that I would of changed was that the seat was longer I have a 18 month old but his really tall he fits now but his head touches the top of the seat n nos feet are right on the bottom, I just know that he will be leaving it by next year. I loved this stroller until my baby actually arrived. Traveling (on a plane) with the bready is DREADFUL if you need to take your infant carrier as well as the standard seat. I hate that the infant carrier and the standard seat cannot be used at the same time. The locking mechanism (when the stroller is closed) is a piece of plastic that can easily be broken. Four months into using this stroller it was no longer easy to push/turn. I dread using my stroller now because it doesn't seem sturdy and has a mind of its own. The stroller doesn't stay straight and the frame actually moves when I try to turn. I'm concerned with the structural integrity of the stroller and will NOT be using it when our second baby is born. This stroller will be going to goodwill soon. I wish we could have it replaced with the b agile or get our money back. Do not waste your money get the UPPABABY VISTA if you're interested in this style. Easy to install. Very sturdy product. Love everything about this stroller. 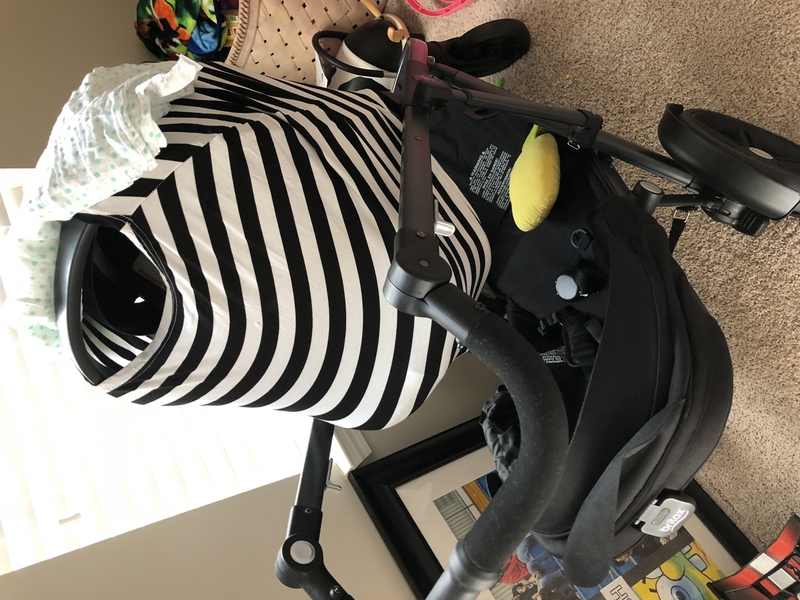 I love this stroller for my two .. newborn and 3 years (yea shes older but we use the lower seat often with her) I really like this product and would recommend it. I use it with the cybex car seat the adapters that I purchased with this seem a little whobbly but not to the point that you can't use them. After much deliberation through out my pregnancy, I decided upon this stroller over the city select double stroller; my selling point was the weigh capacity. Although my 2-year-old only weighs 28lbs, the cap on this stroller is 55 lbs whereas the city select was much less. I think it was around 33?I've only had this stroller less than a month, but I already love it! 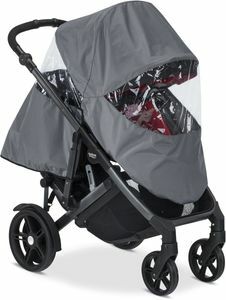 I'm currently using it with a Keyfit2 car seat (had to purchase universal car seat attachment through back channels) and I love taking my daughters for walks in this. It is a pretty heavy stroller, and takes up a lot of roomeven folded, I think more room in my suburban than my chicco cortina stroller did. But I am using it as a double stroller for my 2 girls so, it would make sense I guess. Steering is super easy. At 5 feet tall, I can maneuver it while holding my infant with no issue. ProsConvertibleâ€”I wish I wouldâ€™ve bought this with my first child. Best UsesAs single or double. Multiple accessories and attachments. This stroller is just what I was looking for. I'm pregnant with my third baby and I have a one year old, I love that you can use it as a single stroller or add the additional for the double stroller. 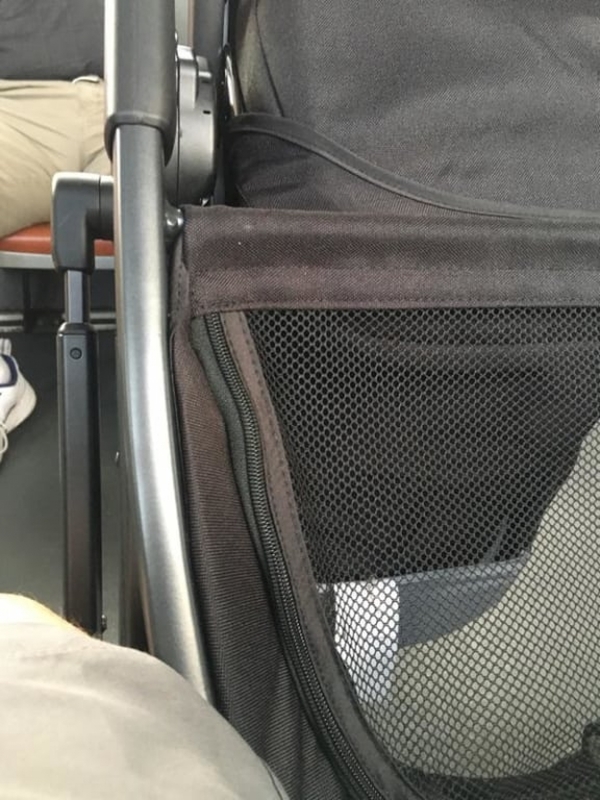 And if your using as a double stroller your leg will not it the second seat as you have so much room to talk my husband is 61 and I'm 56 neither of our feet is hitting the stroller at all with the second seat attached. The stroller itself comes with attachments for the car seat to be used at the top and have a little more extension. It also comes with the toddler bar which is great because its not foam and your child will not be making a master piece out of it; the only think is that it does come with a zipper attached and I find my toddler taking the zipper off all the time. This stroller is super easy to maneuver and you can even just use one hand with the nice grip it has on the middle of the hable bar. The stroller itself is not a bad weight but it really can't be light I mean I'm using it as a double so I didn't expect it to be light. The top seat can rotate for baby to see you but its not such a good idea if the second seat is attached or at least I wouldn't recommend it because its so close to the bottom seat face. A good thing also with the seat is if your baby falls asleep you can easily lay the down without having to wake the. The peek whole at the top is magnetic and not the annoying Velcro which is great if your child is asleep and you want to take a peak. The strollers basket is huge you can fit so many things on the bottom its amazing. The best part of this stroller if your using as a double, it closes with both seats attached, a little in the bulkier side. This stroller is exactly how it looks in the pictures which is great no surprise. I can't really say many negatives about the product because its perfect for me, I hope this review will help you decide on the product. I use to have other Britax strollers, and I always believed that I had the best one! But when I received this one, I was absolutely amazed. It is really handy, flexible, "agile", and multi-function. 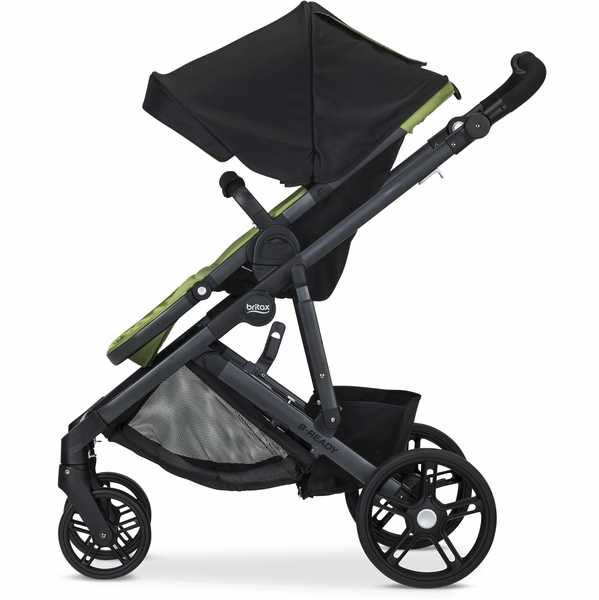 I had the older version of the B Ready stroller (with second seat) and I LOVED it! Unfortunately, I thought I was done having children and gave it to my sister. I bought the new version not too long ago, and it is NOT the same. I love the new basket, the flexibility (with seats in different locations and directions), the compact fold (for a double) and the look. I am not happy that the steering is very difficult. It feels so flimsy. On the old version, I could steer it with one hand, no problem. Very sturdy. The new version I struggle with...even with TWO hands. The front wheels are constantly locking on their own. I am so upset that I wasted my money on this new version. Amazing as a single and a double. I originally purchased a city select 2.5 years ago, but sold it. When I found out our third one was on the way I wanted a single, and was going to buy the city mini gt. When this stroller went on sale for less than the city mini gt during cyber week I snagged it. I am so happy. I was worried my legs would hit the second seat (thats why I didn't buy this 2.5years ago), but even with my long stride my legs come no where close to hitting the second seat. It's my second stroller. No kidding, I bought two strollers just for my LO. But this time, it's worthy. easy to fold, and good maneuver. The only downside is that it is a little bit big in folded mode, but what you should expect for a full size stroller. My baby loves it, we love it. That's all we need. Love the look. Hate how it drives. I got this stroller about 10 months ago and my initial impression was that it was very sharp and high end looking. However, I immediately noticed it was quite heavy for me to lift in and out of the car. Aside from that I was initially very happy with it and it was easy to assemble. We were going into winter where we live and I really did not begin using it outside until about 6 months ago. I use it on the street and sidewalks for walks. It it noticeably difficult for me and my husband to maneuver. So much so that it jerks my daughter around and I often have to back up and redirect in the correct direction. It does not go over any uneven sidewalks easily without me lifting up the front. I am SOOO disappointed in the stroller that I am now looking for an alternative. I am missing my cheap baby trend jogger from my last daughter after this stroller. I love Britax carseats and hoped I'd love their strollers as much. We're on our second set of wheels. We don't do off-roading... just walking around the city have tore up these cheaper wheels. This s hands down the best thing we ever got for our twins! Super bummed about this stroller. I was psyched to get it and love the look but was slightly taken back by the weight. This is something I was willing to look past except in addition to this, the front two wheels are SO HARD for me to steer with. I though I had the breaks on incorrect but fear this is just how they are. I don't know how long I will last with this stroller and am so sad about it. As a mother of a 3 year old and a 19month old, I am loving this stroller! It was easy to put together, it is a smooth ride, its great quality, a lot of space for bags underneath, the seat is cozy and I love how it reclines pretty far back. The handle is also adjustable or me or my taller husband. I love the scooter feature! So does my 3 year old. Its easy to snap off and store away. As a busy mom, I love that I can count on this stroller to get in and out of places quickly with my kids, and I love how stylish it is! I definitely recommend! Very happy with this stroller! We like this stroller so much. Very convenient and flexible for our first born daughter (November 5th. 2016). The only thing we regret was not buying the toddler car seat (which we are planning to buy soon) together with all the other related to the b ready stroller. Only negative thing is the front left wheel lock. It keeps on getting lose and locking the wheel making it hard to manuver. Other than that. We buy Britax products anytime without thinking. This stroller is amazing! I love that the handle moves up and down. Tons of carry space below and my toddler sits up high and can see everything. It does take up a bunch of space when folded up though. If you don't have a minivan or SUV I don't recommend this stroller. Such a great stroller!! I had to upgrade to one that allow for a second seat. A little bigger than I'm used to but to be expected. So far so good and especially loving the storage basket underneath. Albee had this stroller on sale and was the best price I could find. Fast shipping, would definitely recommend! 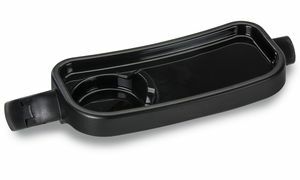 ProsBig basket underneath (can access from front), my toddler likes it (snack tray is a must), easy to use, good for tall ppl, very similar to uppa but half the price, works with the bsafe britax seat. I bought this stroller three months ago, it was great for about two weeks. After that however, the front left wheel became defective. As a result, the stroller is now nearly impossible to turn, rendering it useless. I cannot, in good conscience, recommend this product. I just wanted to write a review so everybody would know that Britax is hands down the BEST company to purchase baby items. The customer service can not be beat. 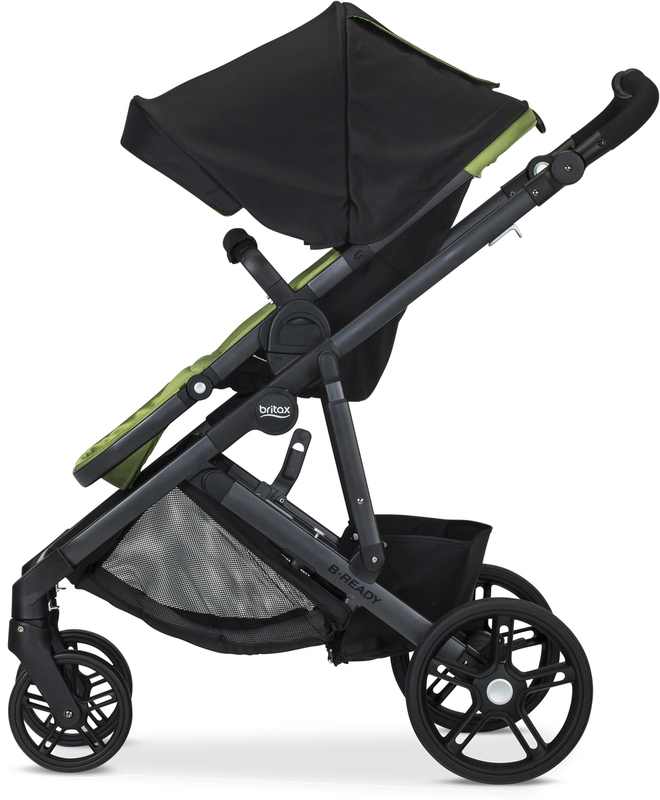 The b-ready is a amazing stroller, so versatile, and a great looking stroller. Thanks britax for everything!!!! We got this stroller to replace the B Agile double since the car seat can't be used in it anymore.We have a 3 year old and a 4 month old. 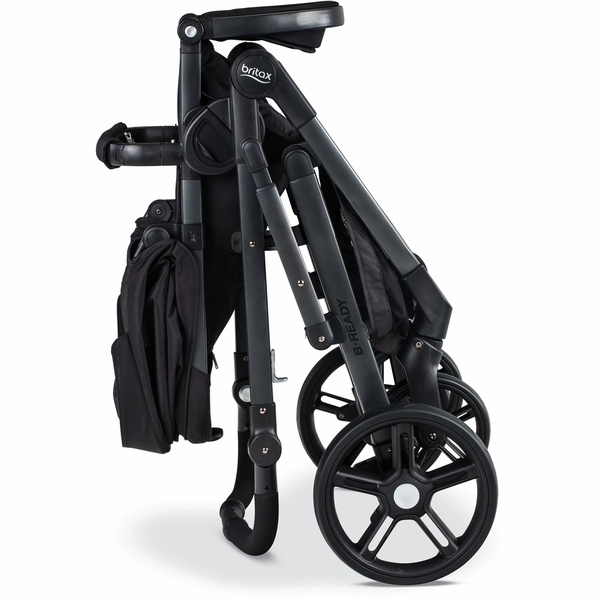 It's great, glides well, tight turns, and large storage basket is great. The only issue we are having is that the infant seat can only face forward on the bottom. My baby HATES when he can't see us and cries non stop. I wish this 2017 version was like the previous one because it could face either way. I bought an older model of this stroller because I had the B-Agile and then had my second child. I wanted an option that could expand to two-seats. Here are the big points: 1. The lower seat being under the other, is also tough because you are maneuvering your child under the handlebar... versus some other brands where the lower child is in front. 2. I do love the brand and the carseats that go with it and use it as a double stroller, all the time. 3. It's very complicated to fold the stroller when it's a double. No one else is patient enough to learn how, so I always end up having to do it. 4. The harness straps are so tight on my very normal-sized kids, who are under the weight limit of the seats. I can't even strap them in anymore, especially if they have coats on. This just can't be ok. What's the deal?? 5. I also wanted the possibility to have two seats and a platform for a third to stand on - it wasn't clear that this wasn't an option until AFTER I bought it. I wish the description was more clear. If any of these were solved with a newer model, I'd love to know! This 2017 b-ready stroller is so versatile. I love being able to turn my baby towards me. This stroller is really easy to maneuver. The front wheels move in a 360 rotation, making it easy to push, the handles adjust up in and down to make it easy for all heights. I'm 5"9 and my husband is 6"4 and we push this stroller with comfort. This stroller is very easy to fold. I wish i can give this stroller a lot more stars because it's worth it, look no further. The basket on the bottom fits a nice size baby bag. Everything about this stroller is amazing. To me the stroller is very light compared to others, Like a Bugaboo and this cost 2 times less. My daughter wouldn't even allow me to take the tag off she was so excited! Taking off and putting back on the wheels is a breeze, just a button away. Britax really did a great job with this stroller. I also own the travel system. I Love Love Love this!!! I got this when I was pregnant with my second daughter and can not stress enough how amazing it is! Going from a single to a double is a breeze and it rides so smooth. 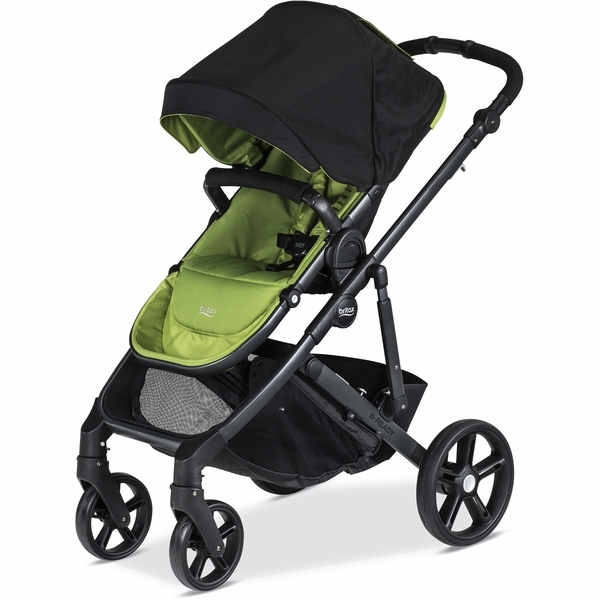 Unlike most big bulky double strollers, this one easily fits through aisles. The 12 different seating options are great too! Best stroller out there ! We have had the stroller a week, and are very happy with it. What I like most is that it is so easy to adjust the positions (recline - up and down, the hole seat - and to turn the seat facing forward or backward) and the big storage unit under the seat. 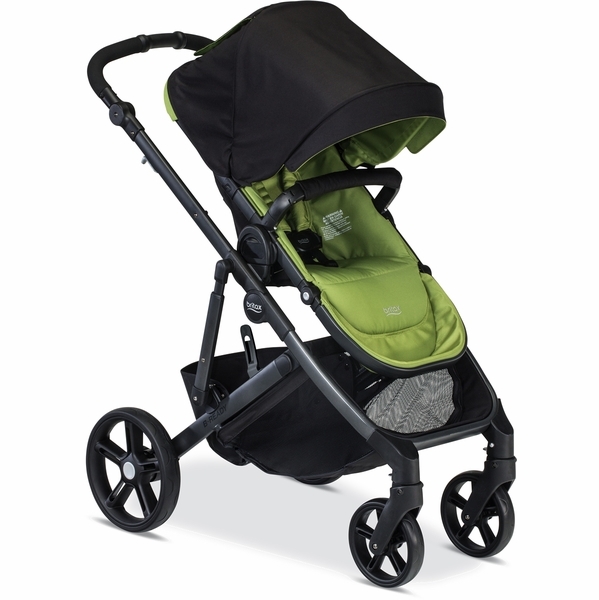 Strollers with two front wheels are a little bit less maneuverable and the ones with one, but they are more stable. My husband and I love our new stroller! My three favorite things are the adjustable handle height (to accommodate my tall husband), the large under carriage storage, and the big canopy (my child never has the sun in his eyes!). We also really like the color, Capri. This is a great stroller for our family! This is by far the best stroller I have owned. I love how versatile and customizable it is! It is great for my two little ones and extremely easy to use! I've been using this stroller for about a month now and it's perfect for day to day use at the mall or a walk around the lake. The wheels are super smooth making it easy to push, the storage basket has an amazing amount of space for whatever baby needs and it folds up smaller than most of the other full size strollers I've used. I love that it looks sleek and high end. Lives up to it's brand reputation! 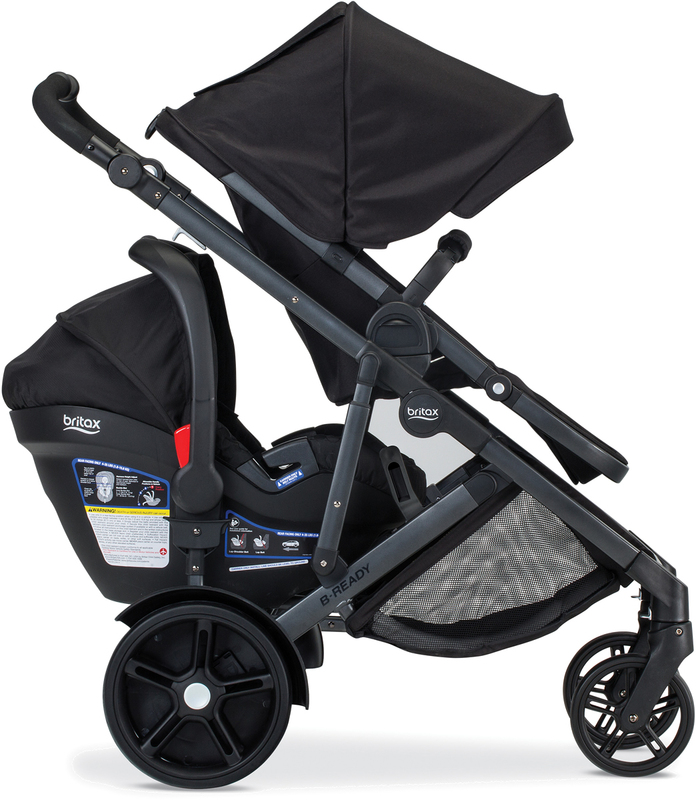 Look no further, The Britax B-Ready is a must! As a very picky person when it comes to strollers, The Britax B-Ready is absolutely everything you need from a stroller & more! The versatility of how it can be used from birth to up to 55lbs, the adjustable handle bar, easily accessible spacious storage basket and super smooth and manageable it is to maneuver, are just some of the many reasons you'll fall in love with the Britax B-Ready! 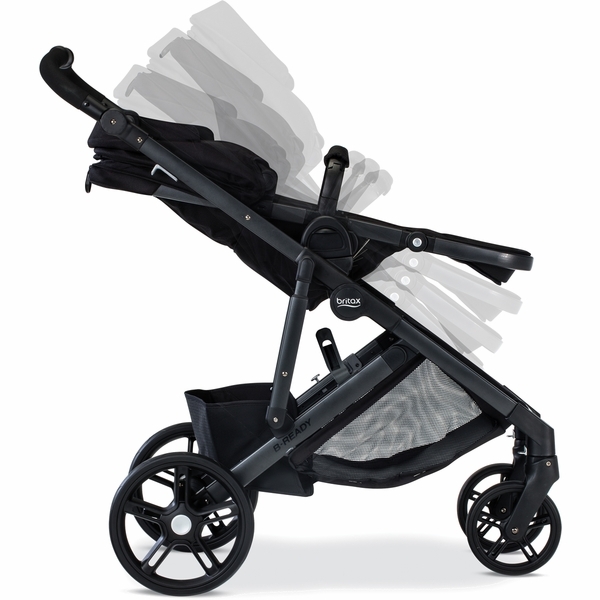 The most user-friendly stroller and SO smooth! 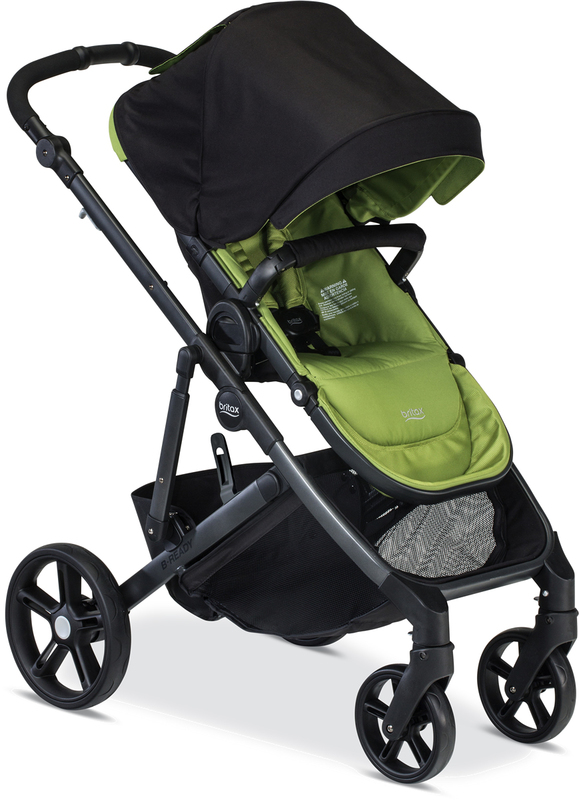 This is the most intuitive, most user-friendly stroller I have ever had. And I've had SEVEN different strollers! It just makes sense. And the different arrangement options for the seating positions is amazing. My whole family loves this stroller! Love the new dark color.And the design most of all the tires are amazing not just some air filled tires. Very easy to manage with one hand. I've had this stroller for about a month now and my daughter refuses to use her umbrella stroller. She her Britax 2017 B Ready! It is a little bit heavy but worth carrying up and down the 4 flights of stairs. My daughter is a very tall two year old and she sleeps comfortably in this stroller, her feet stretch out nicely. I love that I can switch her to face my way when she is sleeping. My family loves to help me push the stroller due to it's adjustable handle bar, it can be comfortably adjusted for short or tall people. I love the big wheels that are big and look like they will handle the snow when it gets here to NYC! Even though the stroller can be little bit heavy to carry down stairs it is very easy to maneuver and feels light when strolling through the city. I got it in the Peridot color and love how pretty it is in person, it is very gender neutral and can easily be cleaned. As a mom who is always on the go, the storage basket is one of my favorites, it is very big and spacious. It can also be easily accessed through the back or front. Definitely worth every penny! Horrible! Taking back second one tomorrow! Horrible! Taking back second one tomorrow! I got the 2017 version days upon being released. The first one lasted two weeks ebefore it started getting harder to turn. Took it back hoping it was just defective. Second one did not even last a week before it became unusable. The issue is with the front wheels. After some use they start to lock up and drag when you turn. Several times this has almost caused the whole thing to turn over when one of the wheels randomly decided to go Rouge. I am very disappointed in have seen several people withave the old version on this thing and it still works great but the new one is not good. I waited months for it to be released and am very disappointed. We will not be trying another one. 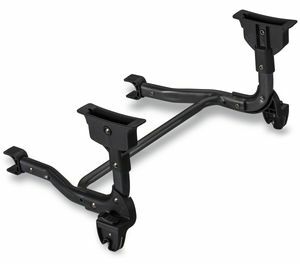 Is the main seat compatible with lower position? Do I need an adapter? 12 seating options adapt to your familyï¿½s needs with multiple seats, a bassinet or infant car seat. The 4-position recline makes it easy to accommodate sleeping infants or attentive toddlers. 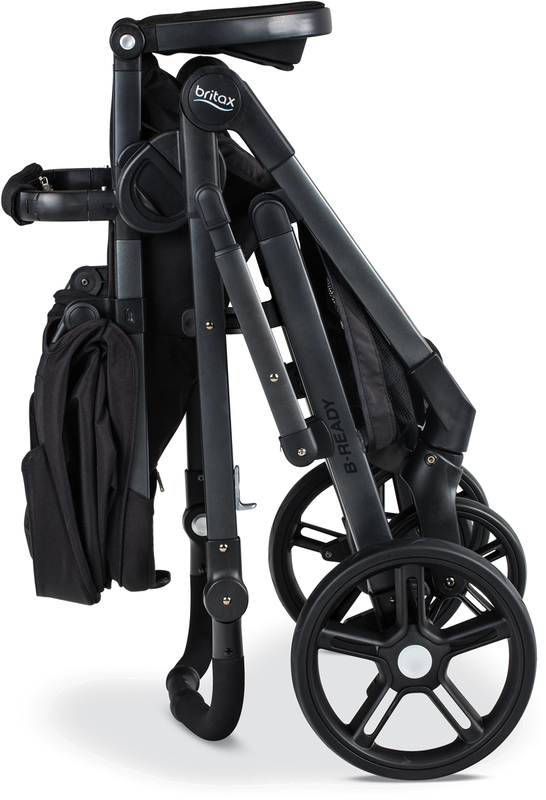 Adjustable handle height with comfort grip raises and lowers to provide the best fit for parents of all heights. An extra-large canopy with ventilation window protects your child from the elements. 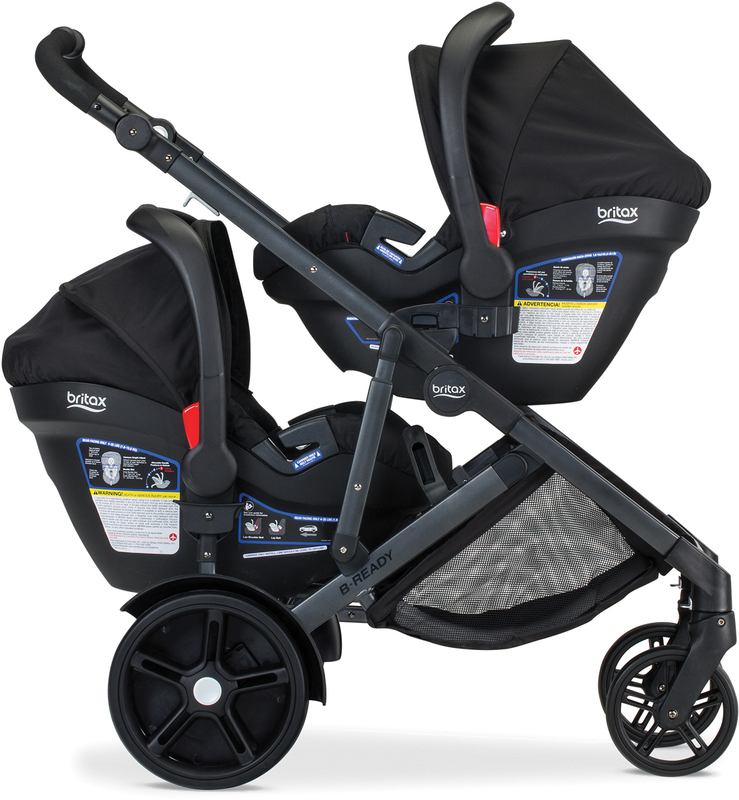 Britaxï¿½s B-Ready is the ultimate stroller for families with ever-changing needs. This model features a modern look. 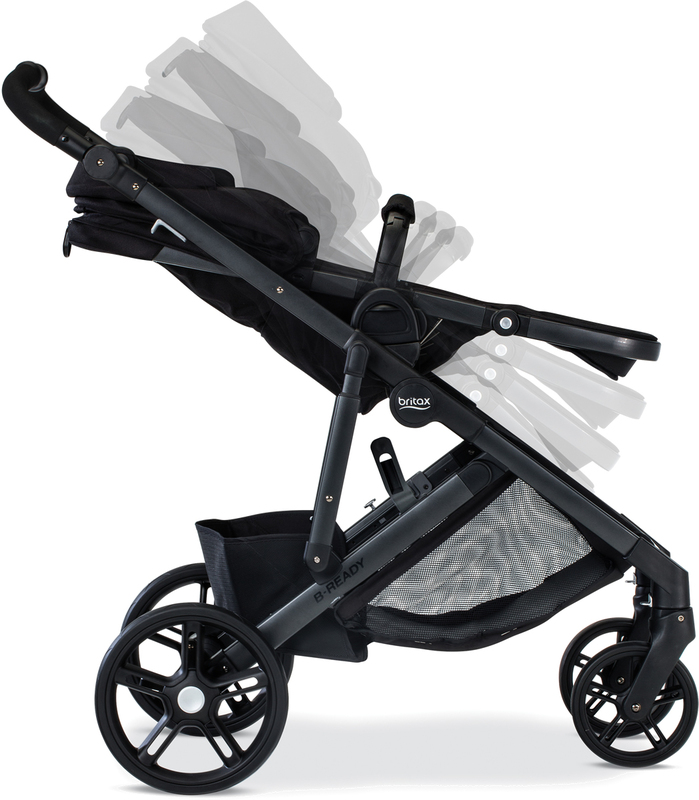 The stroller has an elegant slick frame and tires, and the basket is large enough for all of lifeï¿½s essentials. Along with its incredible versatility, the B-Ready has easy one-step folding, even with two seats attached. It has 12 seating options, so your child can face you or take in all their surroundings when you go for a stroll. 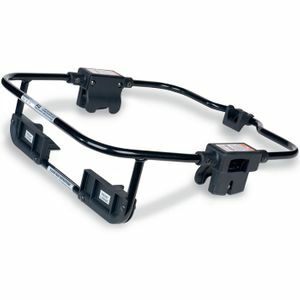 The B-Ready is safe and easy to adjust. 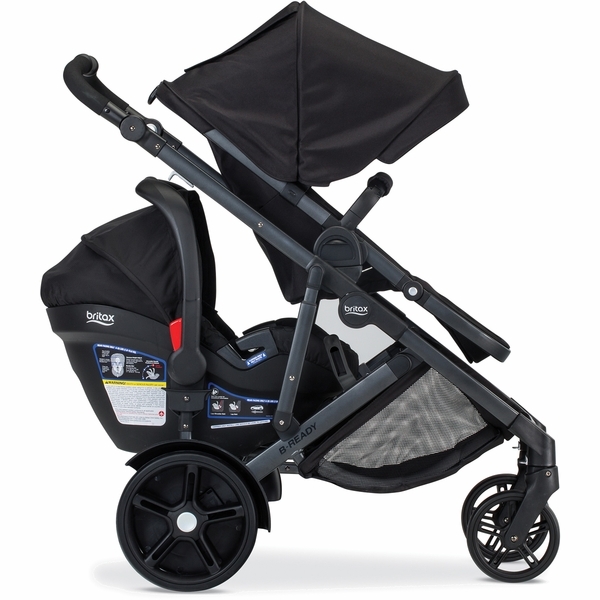 With the Click & Go System, the stroller is compatible with any Britax infant car seat ï¿½ no additional adapters necessary. 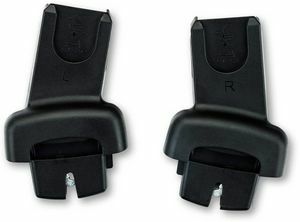 Itï¿½s also compatible with other major infant car seat brands with a Britax infant car seat adapter (sold separately). Parenting is full of surprises ï¿½ face them head on with the Britax B-Ready. Extra-large under-seat storage is accessible from all sides and fits all of lifeï¿½s essentials. 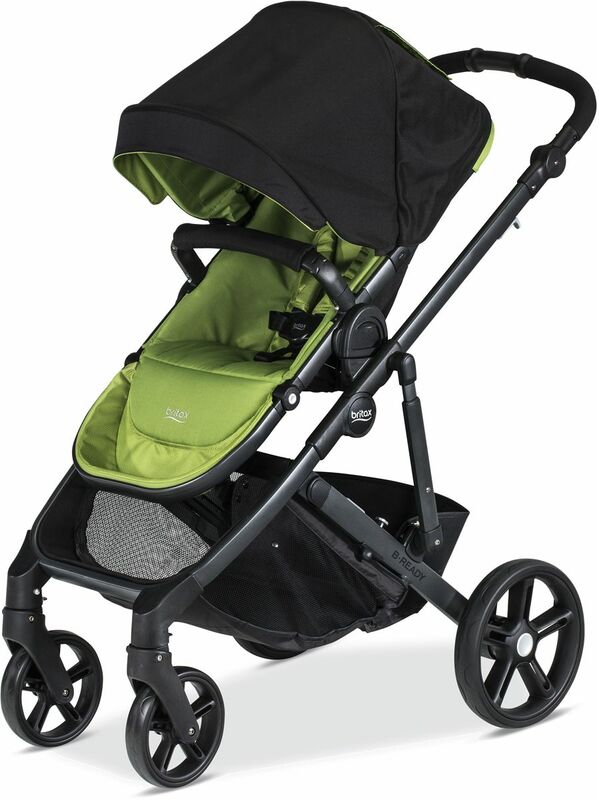 Holds children 6 months old and up to 55 lbs using the strollerï¿½s top seat (included).